My Print Center allows you to upload your print job from anywhere, view and manage your print jobs and view your ACE$ available for printing. Supported formats for upload are Microsoft Word, Excel, PowerPoint, PDF, Images, CSV, RFT, TXT and Visio. Make sure you are on the Job List tab. Navigate to the document you want to print. 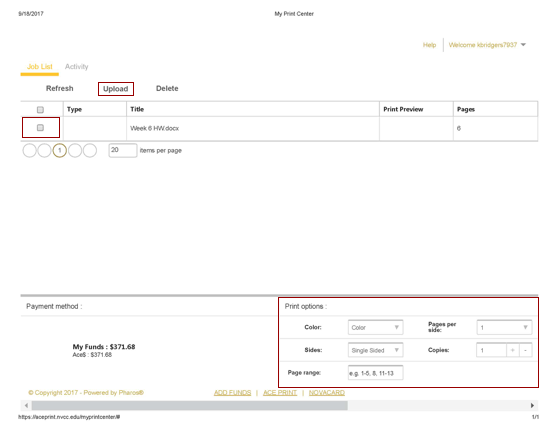 To change Print options Check the Box beside the document and make changes using the Print options at the bottom right. 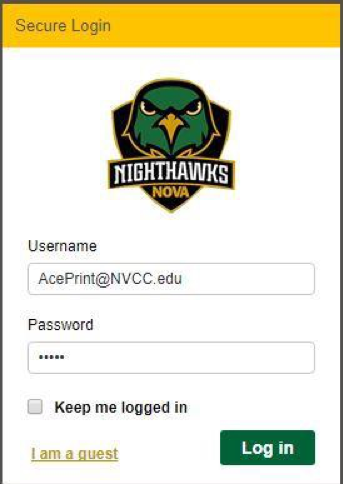 Go to any ACEPrint device on any campus and release your print job. NOTE: If your print job exceeds 20 pages, a pop-up message will appear. Click Print to allow the print to process or click Cancel to cancel the job. Once your print job is submitted, a pop-up message confirming the submission will appear.